Hi! It's Thrifty Thursday! I am your host, Leigh. Thank you so much for stopping by and additional thanks to those who also participate in Thrifty Thursday! I am most delighted to have you join in..for it's YOU who makes it a "show and tell party". I also participate in Tablescape Thursday the host of that fun carnival is the Hostess with the Mostess...Susan of Between Naps on the Backporch. That's no lie or exaggeration, each week I visit Susan's porch and just long to be a guest at any of her tablescapes...especially those held on the porch. 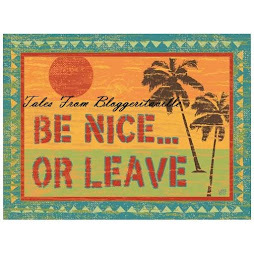 *Thrifty Thursday takes place each Thursday and is hosted here at Tales from Bloggeritaville, but the party is a progressive one, visit the links to see all the Thrifty Thursday links to see the thrifty treasures participating bloggers have to share. *Don't forget to copy and paste the Thrifty Thursday logo button to your computer so you can add it to your side bar and your Thrifty Thursday post. That way visitors will know that your are participating in Thrifty Thursday. I am posting early today, as we are beginning to get some very serious weather even as I type. I don't know if I will be able to post later. 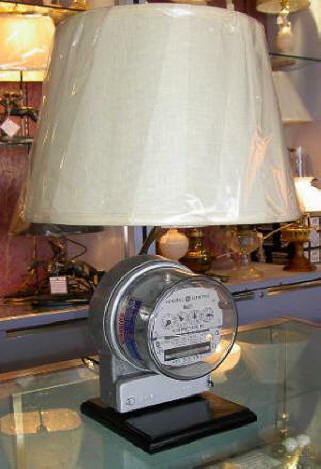 I am thinking the possibilies of us losing power is highly likely. For those of you in the south....Be careful and I am praying for everyone's safety. I mentioned that I paid a visit to my favorite store, At Home, on Monday. I always get inspired when I walk into that store. And that inspiration is the basis of my post today. While in the store I was eyeballing all of the chandeliers and lighting. There was my favorite, that turquoise chandelier. Amazing. I could never duplicate, so I need to get a high paying job/position...quick....so if you have any ideas let me know. Hmm.....Prince Harry is still available isn't he? Oh, yes....but I'm not. There's always some sort of wrench, isnt there? But I digress. I spotted a pair of chandeliers that really stood out and had me saying..."Hey! I can do that!" They were made from bushell baskets, turned upside down and a light source added. I knew I could make them for almost nothing, much less than At Home. If you aren't crafty or don't have the time, you can order one. 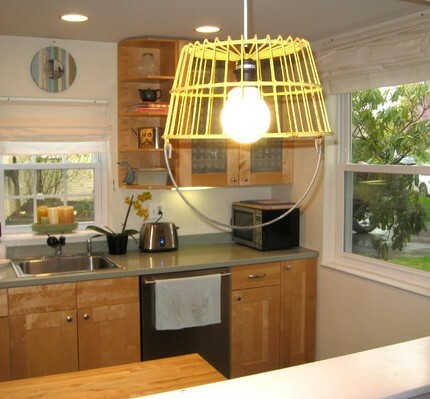 I just love lamps that are created using others materials. Things that aren't obvious lamps, things with a story. 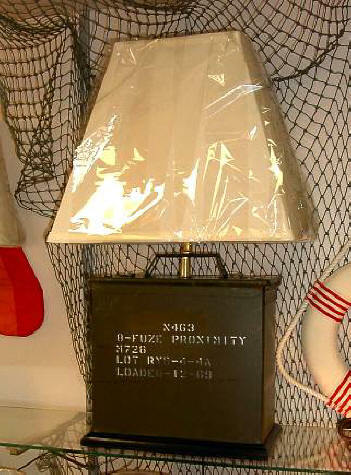 Remember my lamp that I had my precious friend, Jim create for me after I spotted one in a store for $600. I saw one yesterday for $400. 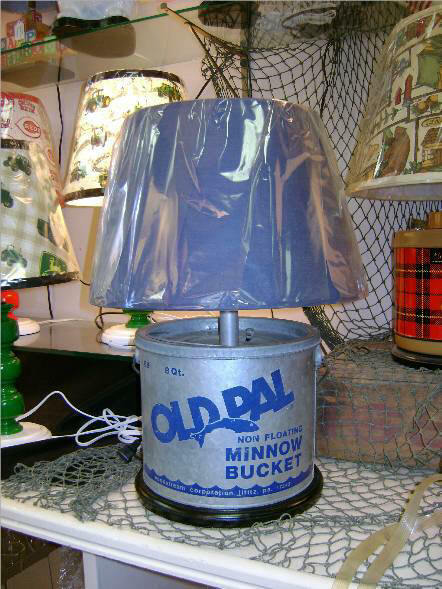 Here are some other lamps made with items that are not your ordinary lamps. These have instant charm and conversation starters attached. 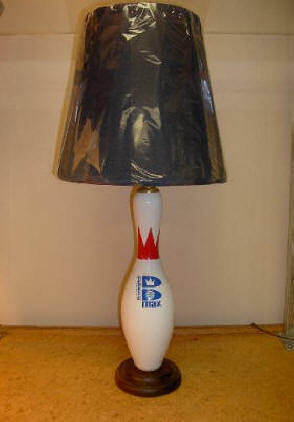 This one is great for a boys room, a man cave, or perfect for a bowler! This one is perfect for a fire fighter...or someone like my Uncle David whose job it is to build and check fire extinguishers. 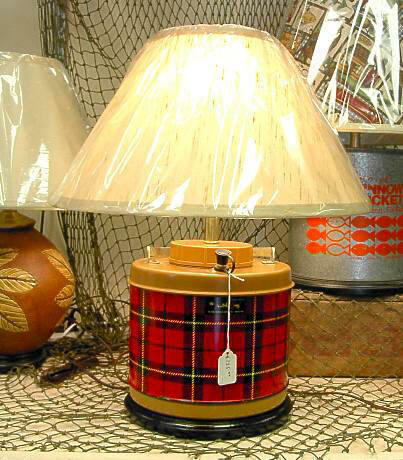 I love this one for a cabin or lake house, even a country home....it's made from a thermos! Think outside of the box! I love lamps made from pottery, baskets, Silver Teapots, antique tins, old architectural molding and pieces. The possibilities are endless! 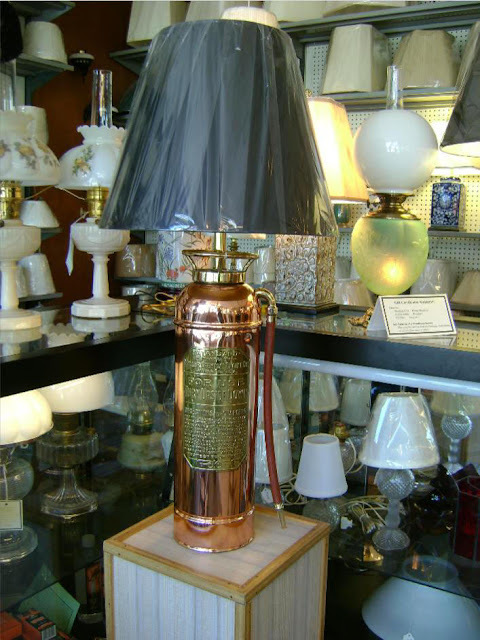 Do you have a lamp that is made from something that wasn't intended to be a lamp? I'd love to know what it's made from! And now onto our tablescape....Tablescape Thursday is hosted by the lovely, Susan of Between Naps on the Porch.. 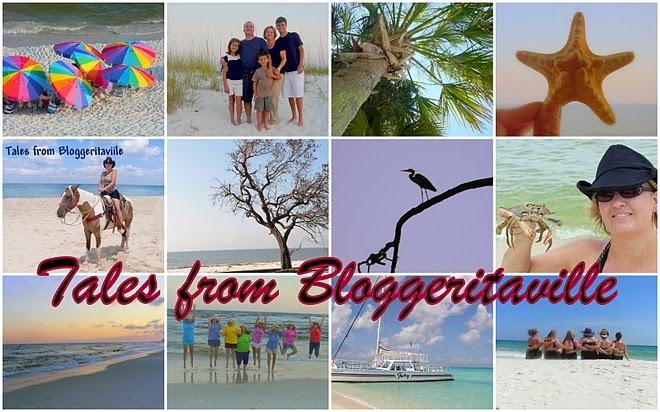 Thank you for dropping my Bloggeritaville today! I have thoroughly enjoyed you visit. Please use Mr. McLinky below to link up your blog. Please link your hyperlink to your POST so that it is easy to find. I love to hear from you. I encourage you all to spread the love and visit the other thrifty Thursday participants, for that's what half the fun is. Aside from seeing a cool treasure it's making friends! Thank you, all, FRIENDS! I appreciate YOU! HUGS! Hope to see you tomorrow, but not before you leave some "roadmap" love! I love me some friends: be they new friends or old friends! Wow, I love all the unique lighting. So cool! I just love some of these. The hanging wire basket is my favorite though. Super cool lamps! Thanks for hosting each week! Just happedned across your blog,I am posting with you for the first time and I am now following. 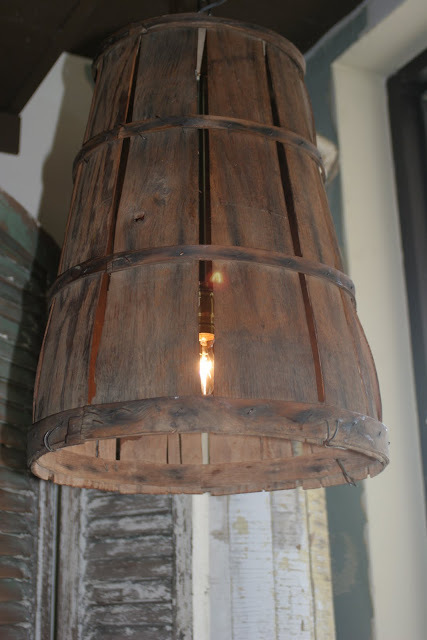 I love what everyone is doing with lighting now...not your mom's 5 ft lamp that took up the entire end table anymore (1960-70's)...Some really original lamps...What a great post...gave me some good ideas! Come on over to The Cranky Queen and join in on the Mother's Day Celebration & Giveaway; I always enjoy your blog and thanks for th Thursday link up! Thanks for hosting. Love all the great projects on here. Thanks for the lamp tour. My favorite is the "Meter". My husband would love that one just so he could turn it off. New follower here as well as your FB page. LOVE the lamps. Cute, cute, cute. Noting beats saving so much AND expending some creative energy. Hi sweet friend! I haven't been by lately...life has been crazy busy and there's no end in sight since I'll be gone for a long weekend and then my grandchildren (Eric's) will be here next week. Life is good though so I'm not complaining! I love your post lamp, nice going! 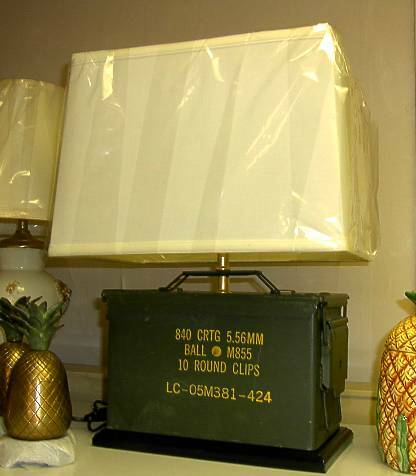 Those ammo can lamps are so cool, I wouldn't mind having one, and I haven't even needed ammo in awhile!